I've never been much of a fan of Southern cooking. Growing up, we'd drive through the Carolinas and sample boiled peanuts or eat alligator meat on a dare - these are not experiences I am dying to repeat. Then I went to New Orleans. I got to hang out with my sister and get a feel for the culture and eat a ton of incredible food. What can I say? I'm in love. And hungry for things like buttermilk biscuits. This recipe is simple, satisfying, and it'll knock your socks off. Even if you're a New Yorker like me. 1. Preheat oven to 450F degrees. 2. Sift together all dry ingredients. 3. With your hands, rub fats into flour until the clumps are pea sized or smaller (make sure to do this as fast as possible because you do not want your fats to start melting!). 4. Pour buttermilk over the center of the flour and mix till dough just comes together. DO NOT OVER MIX! 5. 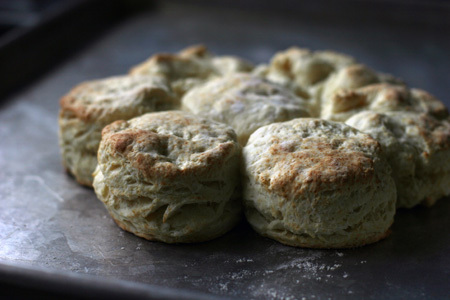 Turn out into a flat surface and GENTLY spread out dough to about 1 inch thickness (the less you touch this dough the fluffier and sexier these biscuits will be!). 6. Cut with a ring mold and place on a greased cookie sheet. 7. Take the scraps and gently press together using as little force as possible to form semi round-ish biscuits. These won't look as appetizing but they will taste 100% better than if you try to smoosh them together to be perfect-looking. 8. Bake at 450F for about 15 to 20 minutes or until they are golden brown. These biscuits can make a simple breakfast of fried eggs and bacon seem like a mini vacation. Make sure to have some good jams and jellies on hand as well!